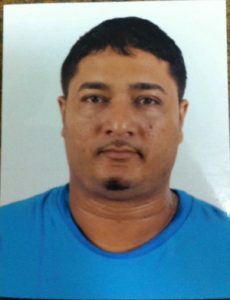 A suspected con artist from Trinidad and Tobago has been arrested and is to be prosecuted for a number of offences before he is deported to his home country, police said. Head of the Criminal Investigations Department, Superintendent Wendell Blanhum told Demerara Waves Online News that Daniel Ali was arrested Saturday evening. The Crime Chief said since Ali’s arrest at Ogle, East Coast Demerara, the Guyana Police Force has informed its counterparts in Trinidad. Blanhum said steps are in train to deport the man. “Two charges will be instituted shortly against him and after the charges he will be promptly deported and handed over to the authorities in Trinidad and Tobago,” he said. Sources said Ali has been posing as a consul of the United States Embassy with the alias and was collecting fees to grant American visas. He has been in Guyana since 2014 during which time he has conned numerous persons of their personal property, cash and rental of premises. Born in 1976, his last known address was Chin Chin Road, Cunupia, Trinidad.